Machine widely used for soft material cutting field in clothing, spinning, leather, automobile, aviation, aerospace, home furnishing and other industries, and help customers increase achievements, efficiency and capacity. 1.) Cutting blade is made of diamond hardness stainless steel, equipment with automatic sharpening device . 2.) Strengthen the steel blade, cutting composite cloth, imitation cloth, carpet, cutting compression to 6cm, with the cold air cooling knife device, automatic regulating system unique knife. 3.) Simple mechanical design and optimization (overall equipment installation less parts, installation height has been completed, the manufacturer) for less than a day to complete machinery installation, mechanical small area, convenient production arrangements. 1. The unique design of the cutting body, the smallest of the vacuum box, vacuum adsorption efficiency is very low, the 12.5KW vacuum pump motor is equipped with inverter, compared with similar products at home and abroad, the energy saving 30%-50%, energy saving and low noise. 2. Can determine the cutting order of the garment piece, can choose whether or not to cut out a particular piece of clothing. 1. How do you send your CNC machine? They are firstly packaged in wooden case. 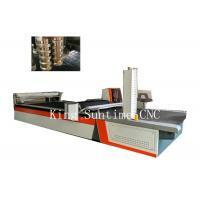 Usually, we send machine by ship, sometimes, as customer's requirement, send by air or by train. When the goods arrive at your sea port or destination, you can pick up goods with the bill of lading we offered. Or we can arrange the cargo agent to send goods to you. 2. How is your warranty and service? After clients purchased our products, our sales with contact with clients frequently, to help clients solve any problem regarding to our products. Also, we recommend clients to prepare some spare parts. We can also send spare parts and wearing parts to clients who need them urgently.